This is something I wanted to set straight, as there is so much talk about who is the "best rapper alive" (not saying any names Vibe). Oops. That list is a travesty to hip-hop, so I won't even start there. But what really irritates me is when people confuse great group for a great artist. See nobody ever, ever, ever puts CL Smooth on their top 5... and should they? Well, as much as I love "Mecca and The Soul Brother", I still know that Pete Rock plays a large part in CL's success. But at the same time, who's going to argue that Eric B wasn't partly responsible for Rakim's success? I give Rakim mad respect, as being one of the illest lyricists ever, and for completely changing the art of rhyming. But don't forget about Eric B. Here's a list of great MC's, whose counterparts are often forgotten. 1. Ghostface Killah- Ghostface almost made our top 5 MC's for the hall of fame. And there's no arguing that Ghost is a legend. Still RZA produced almost all of "Ironman", and about half of both "Supreme Clientele" and "Bulletproof Wallets". And when he wasn't producing Ghost's classics... he was still influencing almost all of Dennis Coles' work. And if Ghost is your favorite MC partly because of his work with the Wu, then you can't even front on RZA there. 2. KRS One- This is another name you often see, KRS One... Queensbridge... MC Shan... The Bridge Is Over. Hip-hop pioneer in every aspect, especially back in his Boogie Down Production days. Some say that Big L officially started horrorcore rap, but I believe he took lots of influence from KRS. Still, Scott La Rock was responsible for a large part of KRS' success... when you think "Criminal Minded" you remember Scott's scratching just as much as KRS' lyrics. R.I.P. Scott. 3. Eazy E-When your an integral part of the most rebellious hip-hop group ever (sorry Public Enemy), your bound to earn some respect. Although the name Jerry Heller is synonymous with Eazy's... his legacy lives on. Boyz N' The Hood... nuff said! But behind Eazy's great stories was a Doc Dre beat which really brought out every detail. Think back to "Automobile" and "Eazy Duz It"... the good doctor was just as responsible s as Eazy was. R.I.P. Eazy E.
4. Erick Sermon or Parish Smith- This is a special case as both rappers were also producers, and thus equally responsible for each other's success. Both have definitely earned their place and owe it to each other. 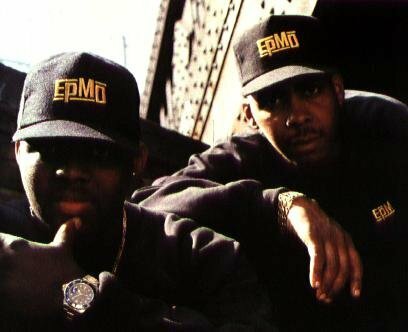 EPMD bought the business to hip-hop. >5. Run DMC-Gotta spread the love to Rev Run, Jay, and DMC. Of course, you expect me to say that as much as Rev and DMC were Run DMC, that Jam Master Jay was behind all there classics. And it's true, but don't forget about Rick Rubin who was the mastermind behind their fusion of rock and hip-hop. Never gets his due credit though. And while Rubin was amazingly influential behind the scenes, it's Jam Jay's legacy that lives on. R.I.P. Jam Master Jay. 6. Guru-This is the exception, everyone knows DJ Premier, and he was actually the star of Gang Starr. Guru was a multi-talented rapper, who could flow over any beat (Jazzmatazz anybody? ), but you can't overstate Primo's contribution to this group, and to hip-hop as an artform. Every producer studies DJ Premier as they're making beats, but sadly you can't say the same thing about Guru. I know I missed quite a few, Kool G Rap and DJ Polo, De La Soul, Tribe and Ali Shaheed Muhammad, Main Source and Large Pro... the list goes on. This will be a recurring feature, so leave some suggestions and comments. big ups for ghost being at number one. he's hands down my favorite emcee of all time. part rakim, part wu-tang, but all around the dopest ever.